begins with a choice! YOUR CHOICE! Let it begin now! It is a process! It is your process, sir! 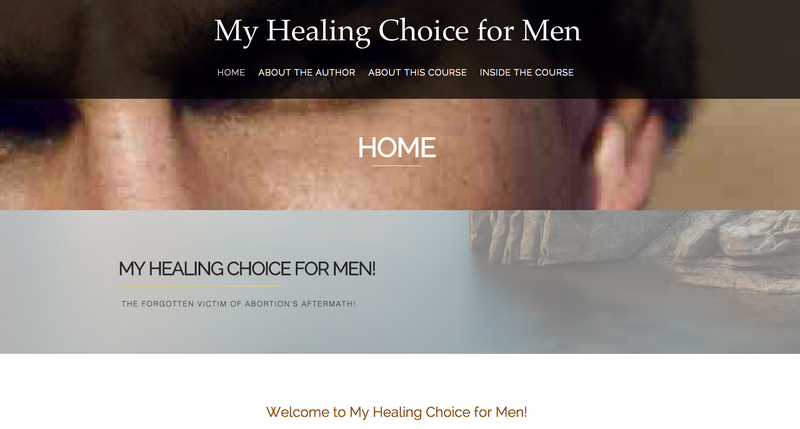 It is a process we call My Healing Choice for men! A complete Men’s Recovery Course. WHY? Because it involves many choices you will be making in the days to come. The most important choice is to say I Need Help! The Men’s Recovery Course is a life-impacting, life-changing course built upon the proven recovery process called Free Me to Live. However, it has been written specifically for the man who has abortion in his past. KEY ADVANTAGES OF THIS MEN’S RECOVERY COURSE ONLINE? Convenience – the ease of being able to ‘communicate’ and discuss this on their computer, in the privacy of their own home, at times that are convenient for them. Privacy – the anonymity of using a computer and not having to talk face to face right away about what was and is for some a totally upsetting and incredibly painful issue. Safety – they like not having to use their real name, and be private. Ease – Also for many it is easier to type things then to write them, especially when it comes to this issue! Choices to either move toward healing and restoration or to move away from healing back in to your pain. Thus, this Men’s Recovery Course process starts with a choice: Will you start this proven process to overcome your hidden hurts? Examining yourself will help you identify why you hurt! This gives you the ability to move forward! We all face many choices before we are healed and restored. LEARN MORE! VISIT THE COURSE ONLINE!